Hizbullah slammed PSP leader Walid Jumblatt's opposition to tying Lebanon's future to the liberation of Shebaa Farms from Israel. Hizbullah slammed Thursday Progressive Socialist Party (PSP) leader Walid Jumblatt for his opposition to linking Lebanon’s fate to the 'liberation' of Shebaa Farms. “Hizbullah rejects outright such statements based on the party’s ideology toward the conflict with Israel,” Hizbullah MP Hussein Mousawi said in remarks published Thursday by the Kuwaiti daily Al-Anbaa. “As long as Israel continues to occupy not only territory in Lebanon, but also Arab territory as well as Muslim and Christian territory in Palestine, the party is ideologically committed not to trust usurpers and occupiers and consider their presence as an attack on both Islamic and Arab nations,” he added. Mousawi’s comments were in response to Jumblatt’s tough stance on controversial statements made by Maronite Patriarch Beshara Rai during a visit to Paris last week. “Linking the fate of Lebanon to the liberation of the Shebaa Farms and linking its future to all the region’s conflicts are rejected,” Jumblatt had said. Jumblatt also assailed the religious leader’s controversial remarks that linked the fate of Hizbullah’s arms to a Middle East peace settlement, saying Lebanon could not remain hostage to regional conflicts. Rai, who said Tuesday that his remarks had been taken out of context, stressed that Bkirki, seat of the Maronite Patriarchate, would adhere to its historical commitments and keep dialogue open with all political parties. In his Interview with Al-Anbaa, Mousawi said that Jumblatt’s statements were not unusual and that the Lebanese people were “no longer surprised” by the PSP chief’s various stances. 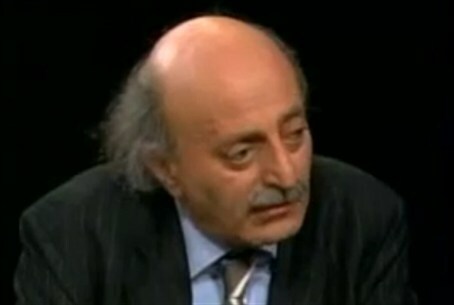 Jumblatt, who in 2005 was a leading figure in the Future Movement-led March 14 anti-Syria coalition, later realigned himself with the Hizbullah-led pro-Syria March 8 alliance, and now describes himself as a centrist. Hizbullah's refusal to disarm and disband its militias, and its insistence on using them to drag Lebanon into conflicts with Israel, has become a major point of contention between the March 14 and March 8 factions. So angry have Hizbullah's leaders been over criticism on the issue, that they have issued veiled warnings that they will "take action" if criticism doesn't end.